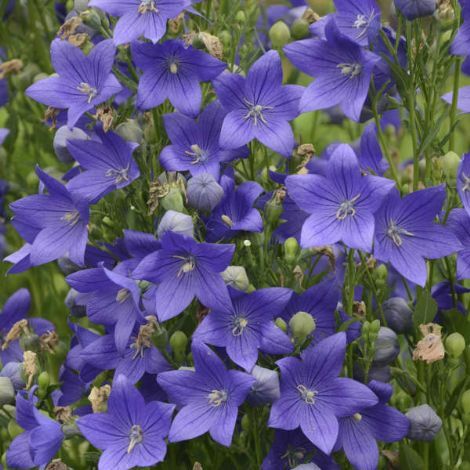 A vigorous and reliably long flowering full sized Balloon Flower, Fuji Blue produces both single and double purple-blue flowers with darker veining beginning in midsummer and continuing into fall atop a vigorous upright growing stems that can exceed 3' high. 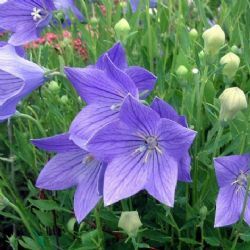 This was one of the top-rated Balloon Flowers receiving 4 out of 4 stars in the ten year long trials at the Chicago Botanic Gardens. Balloon Flowers are taprooted perennials that produce more and more flowering stems as the plants age and expect this one to reach about 2-1/2' wide at maturity. Fall brings foliage colors in purple and yellow shades. 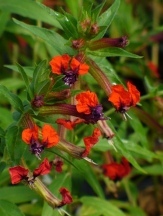 An easy and low maintenance conversation starting perennial for the garden and landscape. Image courtesy of Walter's Gardens, Inc.
Deadheading will help to promote flowering until fall. Balloon Flowers prefer to not be disturbed after establishment. Slow to re-emerge in spring so don't give up on it and watch that you don't damage the new stems when they are emerging in spring. It may be a good idea to leave last years stalks in place as a marker until you see the new stems emerging in spring. Sear the flower stalks when used as a cutflower. Soil & Moisture: Average moist well-drained moderately fertile soils. 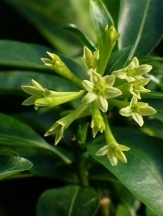 Flowering Period: Early to mid summer to fall. Fertilizing: Spring to about midsummer. Pruning: Prune away last years brown stems in winter or wait until growth begins in spring. Periodic deadheading will help to promote continuous flowering. 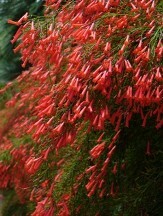 When to Plant: Any time of year from containers - fall, winter, and spring are easiest. Deer Resistance: Poor to Occasional damage Deer resistance is relative to how hungry the deer (or other herbivores) are, what food is readily available in their natural habitat, and how tasty a particular plant is. Few plants are truly completely 100% resistant to being browsed by hungry deer and other herbivores. Please realize that this is just a guide based on our experience and research but some plants may never ever be bothered. Dormant Shipping: We generally do not ship these in dormancy.